Philip Aubury, organiser of Alvechurch Open Gardens, offers advice on getting your garden ready for summer. Well, it was a long hard winter and at Easter we were at least two weeks behind normal – but as the sun came out in May, Mother Nature began to catch up. By the start of June we should be past the risk of any late frost, so you can safely plant out all those tender bedding plants and lots of young vegetables. So often there are tender bedding plants on sale in April, which is great if you want to plant up tubs and baskets and you have a porch, conservatory or cold greenhouse to protect them from frost. It can be very tempting to plant out too soon, only to see your time and money wiped out. 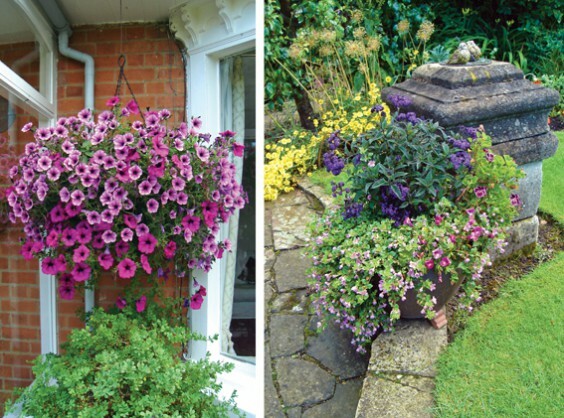 Tubs and baskets will require watering, feeding and dead-heading throughout the summer, but they can be very colourful so make sure they are in the most prominent positions. It is worth noting a few important points to get the best from your containers. For tubs and troughs, do ensure there are good drainage holes in the bottom. Some containers for use in conservatories don’t have holes and if used outside, your plants can drown. Traditionally the holes in the bottom have been covered in “crocks” but few people now have broken clay pots, so break up some polystyrene packaging to cover the bottom. Use a good-quality all-purpose potting compost. For permanent plants like bay trees or shrubs I use John Innes, but for bedding plants this can be too heavy. I always mix some slow release fertiliser into the compost as this reduces the need for liquid feeding in the summer. Don’t just use garden soil as you will be very disappointed with the results. There is a very wide range of summer bedding plants to choose from these days, but do select strong healthy plants. Avoid lanky, pale or wilted ones. Water and allow to drain before planting. Choose a range of plants – perhaps a tall one placed centrally if the tub will be seen from all sides but towards the back if it is going to be against a wall. Surround this with smaller plants but leave space for some trailing plants at the edge. Do be careful to ensure the spaces between the roots are well filled with no air spaces and the finished level is an inch or so below the rim to allow for watering. Colour schemes are a matter of personal taste. The hanging basket pictured above uses two closely-matched petunias, while in the mixed tub the beautifully-scented heliotrope takes centre stage. Note the feet under the tub to make sure it drains well. Don’t forget that there are automatic irrigation systems which can save you hours with a hose or watering can. The baskets on the outside of Alvechurch Village Hall have just such a system. Keen gardeners often spend far too long working in their gardens. OK, it is great exercise and saves on the gym subscription, plus it is very good for mental wellbeing. However, we all need to take time out to sit and enjoy our gardens. There are two things that can make gardening so much easier. Stainless steel tools have been around for many years, but the newer aids are the modern lithium ion rechargeable power tools. I’ve had my stainless steel trowel since I was a teenager, and my spade was a 21st birthday present. Although a little worn after fifty years it is still going strong. I’m always amazed when I see gardeners struggling with old rusty tools. Still on stainless steel tools, a good hoe can save you hours. They are self-sharpening and if run over the soil just as weed seeds are germinating, you don’t have to clear up the weeds as they will dry up very quickly. The development of tools with rechargeable batteries can save you loads of time and effort. No smelly and noisy petrol engines, no more extension cables with the risks they can pose. 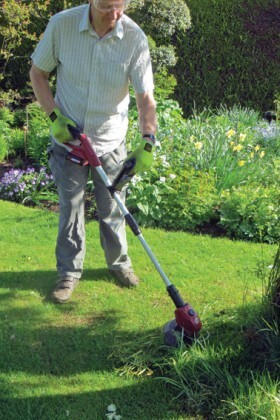 There are rechargeable hedge trimmers, strimmers, mowers and now even sprayers and fertiliser spreaders – but the pièce de résistance has to be the automatic mower. I first saw one of these many years ago in Scandinavia. It was programmed to come out each evening and wander round the lawn before retuning to its ”cabin” where it plugged itself in to recharge! A guide wire buried under the edge of the lawn ensures that it does not stray into your borders. These are now readily available in the UK. The strimmer pictured right has a wire guard to protect trees from having their bark shredded at ground level and the small hand trimmer is great for shaping bushes. Enjoy your garden this summer. Alvechurch Open Gardens takes place on Saturday June 23 and Sunday June 24. This year many of the regular gardens are opening again for the National Gardens Scheme, from 1pm to 6pm on both days. New this year are 18 Bear Hill; 69 Birmingham Road, and The Moat House (pictured above) in Radford Road. Also, although not listed in the NGS book, The Shrubbery in Bear Hill will again be joining in. Over the past year their new house, Wychwood House, has been built in the garden. Some trees have already been planted here and a wild flower meadow sown. Philip Aubury, M. Hort., retired director of Birmingham Botanical Gardens.